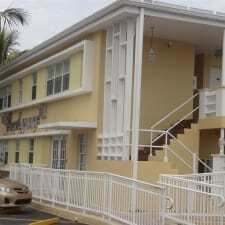 Beach Place Hotel is an ideally located hotel just one block from the North Shore Park. Guests at this hotel will find a heated outdoor pool and free Wi-Fi throughout the property. Each of the hotel’s air-conditioned rooms features a tea/coffee maker, ironing facilities, a desk, private bathroom, and TV with cable channels. Amenities at this family-friendly hotel include free self-parking, on-site ATM, tours and ticket assistance, a TV in the lobby, and laundry facilities. There are no dining facilities within the hotel, but nearby restaurants include Subway, Denny’s, Moncheese Pizza, and Rancho Grande Mexican Restaurant. Beach Place Hotel is only one block from the beach and a five-mile bus ride from downtown Miami, South Beach, Aventura Mall, and Calle Ocho. Miami International Airport is an eleven-mile drive from the hotel. This hotel is in the affordable price bracket but still offers a little more than regular budget accommodation. It's not in the ever popular South Beach area but for the price you pay, it's worth taking the bus there each day. If you are driving to Miami or renting a car, then you'll appreciate the fact that there is free parking anywhere in this busy city. The lot can get full during the day as they allow some public parking but at night there are plenty of spaces. North Beach is never too busy, and you can relax there without being bothered by the crowds you find on South Beach. This hotel is literally across the street from the beach which is a real bonus for many guests. Some guests have noted that this area isn't as nice as they expected. It seems a little rough around the edges, and some have said they wouldn't walk around the area after dark. There is quite a bit of traffic noise that makes its way into your room, so if you are used to a quiet environment at night, you may find it difficult to sleep. The air-conditioning units are also said to be a bit on the noisy side, but there's not a lot that can be done about that. The pool is a nice amenity to have at any hotel, but the management need to have more cleaning staff on duty to take care of it. It's not in very bad condition, but there are a few loose tiles and sometimes a stain here and there.